Objectives: Polycystic ovarian syndrome (PCOS) is a common hormonal disorder that can lead to hirsutism, menstrual disorders, obesity, acne, and sometimes abortion and infertility. Considering the effect of PCOS-induced obesity on quality of life, the present study was aimed to evaluate the quality of life specified for polycystic ovary syndrome and its relationship with nutritional attitude and behavior. 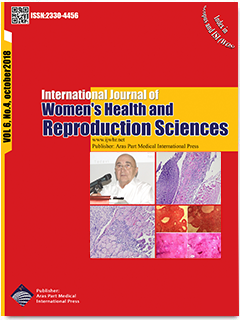 Materials and Methods: This cross-sectional study was done on 150 PCOS cases through convenience sampling in educational hospitals of Tabriz, Iran, in 2015. The used tools included socio-demographic questionnaire, Polycystic Ovarian Syndrome Questionnaire (PCOSQ), Three-Factor Eating Questionnaire (TFEQ-R18: uncontrolled eating (UE), cognitive restraint (CR), and emotional eating (EE)), and a questionnaire of eating attitudes (Eat-26: including food preoccupation, dieting, and oral control). The relationship between the quality of life and nutritional attitudes and behaviors was evaluated by Pearson correlation and multivariate regression analysis. In this study, P < 0.05 was considered significant. Results: A mean quality of life score of 16.58±4.18 was obtained out of 0-35. Nutritional behavior averaged 42.28±19.63 out of a min-max range of 18 to 72. Mean nutritional attitude score was 24.64±12.55 out of 0-78. A significantly inverse relationship was observed between the quality of life and nutritional attitude (P < 0.001, r=-0.317), as well as nutritional behavior (P = 0.015, r=-0.198) in participants. In other words, the quality of life scores increased when nutritional attitude and behavior (positive attitude and behavior) decreased. Multivariate regression analysis showed that EE, dieting, and history of pregnancy were predictive variables affected the quality of life. Conclusions: There was a relationship between nutritional attitude and behavior and quality of life specified for polycystic ovary syndrome. Therefore, it is necessary to pay attention to nutritional and other predictors through better health planning for these women.